1. Preheat the oven to 200°C, gas mark 6. Place the potatoes in a large pan, cover with cold water, bring to the boil and simmer for 12-15 minutes until the potatoes are tender. 2. Meanwhile, melt the butter in a saucepan. Add the flour and cook for 2 minutes. Gradually beat in the milk, then bring to the boil and simmer gently for 2 minutes until thickened. 3. Remove from the heat and stir in the haddock, prawns, petits pois, three quarters of the cheese, the mustard and the chives. Spoon into a heatproof dish. 4. Drain the potatoes well, then mash until smooth. Beat in the extra butter and milk, then spoon over the filling. 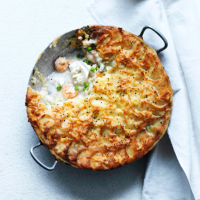 Scatter over the reserved cheese, season and bake for 30 minutes until the fish and prawns are cooked through and the pie is bubbling and golden. This recipe was first published in Thu Mar 16 10:13:00 GMT 2017.